Turned On Its Ear: Hot Mall Cop Action! There’s nothing like feeling a bit like your teenaged self for a minute or two, especially in the shadow of something that’s trying to sell you that exact feeling. It was a routine trip to the Galleria, the local mall that’s been our area’s shopping Mecca since I was six years old. 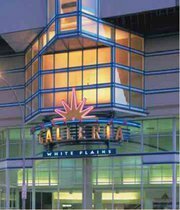 Like most shopping centers of its vintage, the Galleria has enjoyed more happening times; while not exactly a “dead mall” yet, it has seen enough national chains replaced by local dollar stores in the last few years to qualify as having undergone what retail planners might call a demographic shift. Still, the Galleria is hanging in there enough to still support an Old Navy, and with spring comes the need for any lazy dressin’ male like myself to add a few new ringer t-shirts to his collection. Like most enclosed malls within walking distance of a small city, the Galleria was overrun with teenagers lookin’ for nothing to do back when I was, well, a teenager myself. It became a bit of a game to see who was going to be hassled by the rent-a-goon security squad. You didn’t really have to do anything per se to be selected for a fake cop scolding, which was what gave the game its element of random chance. Kids would do outrageous things and walk clean; others would linger a moment too long outside Sam Goody and get to feel the not-so-long arm of mall justice. No one was immune, self included. This is where you, dear blog readers, come into the story. I was coming off an escalator on the food court level, when a sign on an empty storefront caught my eye: FOREVER 21 WILL REOPEN HERE SOON. CLOSED FOR EXPANSION! “That will be perfect humorous blog fodder”, I thought to myself, and reached for my cell phone to take a picture as I thought up witty captions for the photo. I backed up a few steps, squared the shot, and just as I was about to snap it I felt an arm on my shoulder, followed by a voice: “Yoo can’t take pitchers in da Mall.” The arm on my shoulder fell away. Sadly, that sentence must have contained a word or two that did not compute to the rent-a-goon. His reply was disappointingly predictable: “You take pitcher in da mall, you get kicked out.” With that witless rejoinder, I sold my soul to the man: I put my cell phone away, and headed towards the great ringer t-shirts in the sky (well, the third floor, but you get my drift). Being stopped by a rent-a-goon is a young man’s pursuit: I was happy to have been able to indulge in it one last time, but the full war? That is, taking the picture and proceeding on to the ringer t-shirts? That’s a battle for a real teenager, not one for a dude who’s eighteen twice over. The smug snicker one can derive from it all, however, is not even remotely age specific. Galleria marquee, stolen from their Facebook page. Take that, society!